One of the few complaints I can levy against the defensive staff after the weeks leading up to the Michigan State game was a lack of the innovative blitzes that Mattison showed early in the season. Michigan State, being a strictly pro-style offense, appeared to be the perfect team for Mattison to unveil a few of his NFL-style blitzes. In my opinion, the team didn't blitz nearly enough in the game. For the most part, any D-I offensive line can pass protect against four straight-ahead rushers, which is what the Spartan line was tasked with for most of the game. Occasionally, Mattison would bring a blitz, however, and on this example, he utilized a zone blitz but oddly used man coverage behind the blitz rather than zone coverage, necessitating that Michigan's defensive ends cover players they had no ability to cover. It's third and eight with about four minutes left in the third quarter. Cousins had just thrown the backwards pass that wasn't a backwards pass. Michigan is in its nickel package with Coutney Avery as the nickelback and Desmond Morgan and Kenny Demens as linebackers. Before the snap, Michigan's linebackers show blitz, as does Jordan Kovacs who has come down from his safety position. These three will blitz the A gap, not unlike Michigan State did against Michigan all game. As the ball is snapped, Michigan's defensive ends (Craig Roh and Jake Ryan) both drop off into coverage as Demens, Morgan, and Kovacs blitz the A gap. 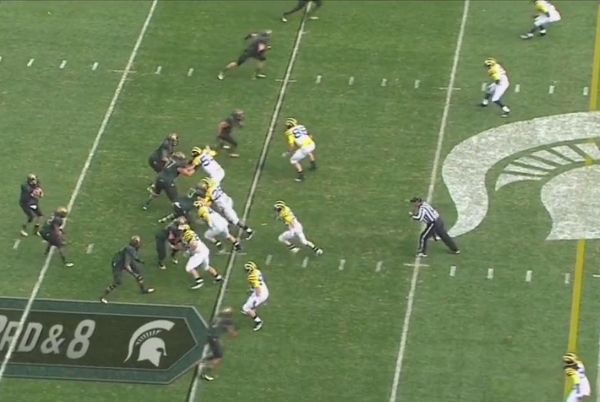 On the strongside of the field, you can see Avery and Blake Countess in man coverage against MSU's receivers. Roh is also assigned to man coverage against MSU's H-back. Ryan, lined up against BJ Cunningham on the weakside of the field is supposed to be in man coverage. You'll see in a minute that he is confused about his assignment on the play. The blitzers are now getting into the backfield and will have a free run at Cousins (there aren't enough blockers to protect him). Roh is engaged with the MSU H-back. FWIW, I think he'd probably be called for defensive holding if the play had ended differently. On the weakside of the field, Cunningham is running behind Ryan. Cousins already recognizes that Ryan has missed his assignment as is getting ready to throw to Cunningham once he clears Ryan. Morgan and Kovacs have blown by the MSU running back and are charging after Cousins. You can see Ryan pointing at Cunningham. Ryan thinks that this is zone coverage, and he's trying to alert Roh to the crossing route. Unfortunately, Michigan is in man coverage. At the last minute, Ryan realizes that he's blown his coverage, but Cunningham is already wide open. The blitz was a step too late. Blown coverage aside, this emphasizes the danger of running zone blitzes: if the blitz doesn't land, you have defensive ends in zone coverage against zippy slot receivers. This almost always ends poorly. This play, however, is especially perplexing. 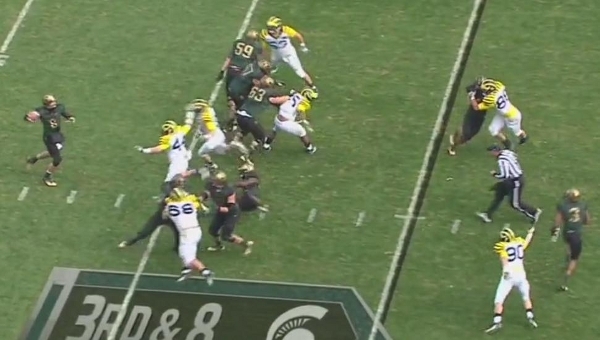 I can't understand how Mattison can call for man coverage from the defensive ends on a blitz, especially asking them to cover wide receivers. If they are assigned to tight ends, fine, they might be able to handle that. But asking Ryan to cover one of MSU's best receivers in man coverage is suicide. I think the design of the play calls for Ryan to jam Cunningham at the line of scrimmage so that the A gap blitz has time to land, but that's a risky call. 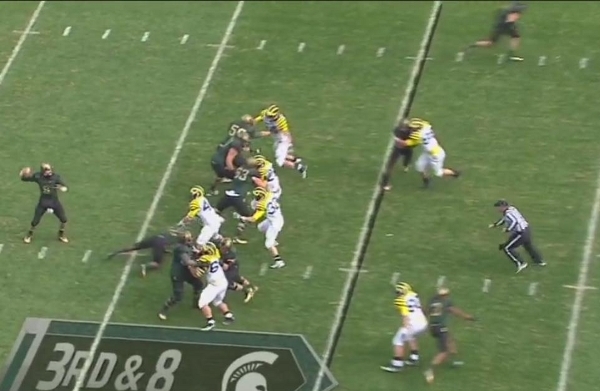 You can see the difference between this A gap blitz and the ones that MSU used against Michigan. 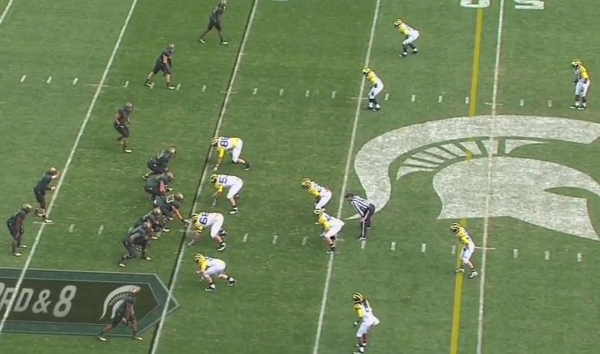 As MGoBlog pointed out, MSU was timing Michigan's snap count and able to get into the backfield almost immediately. 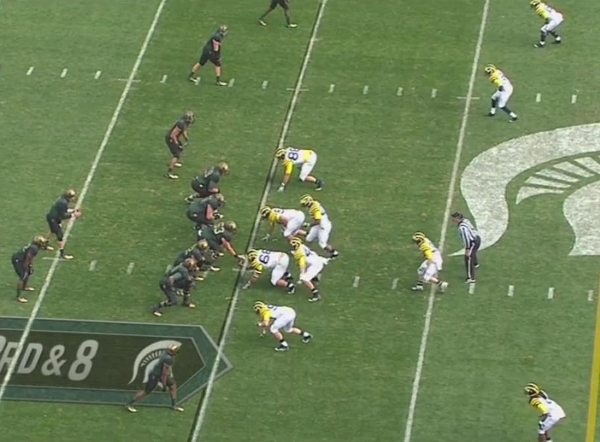 The Spartan defenders were able to build a full head of steam pre-snap. Michigan's blitzers, however, were slowly creeping to the line of scrimmage when the ball was snapped. Though I'm not positive, I think Ryan or Roh has done this before. It's something to watch going forward. 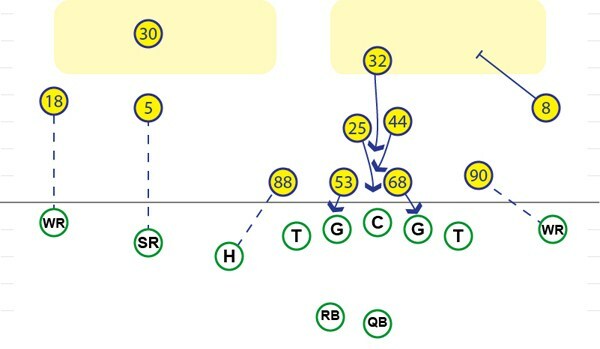 If the defensive ends continue lining up too far from the line of scrimmage on the zone drops, it will tip off the blitz and coverage to opposing QBs. It didn't here, and I'm not sure if it's noticeable enough in real time, but it looks to me like it is. Ryan's helmet is a full yard off the line of scrimmage. If opposing linemen start picking up on this pre-snap, they can tip off the quarterbacks to a likely zone blitz. It will also help them in pass protection.